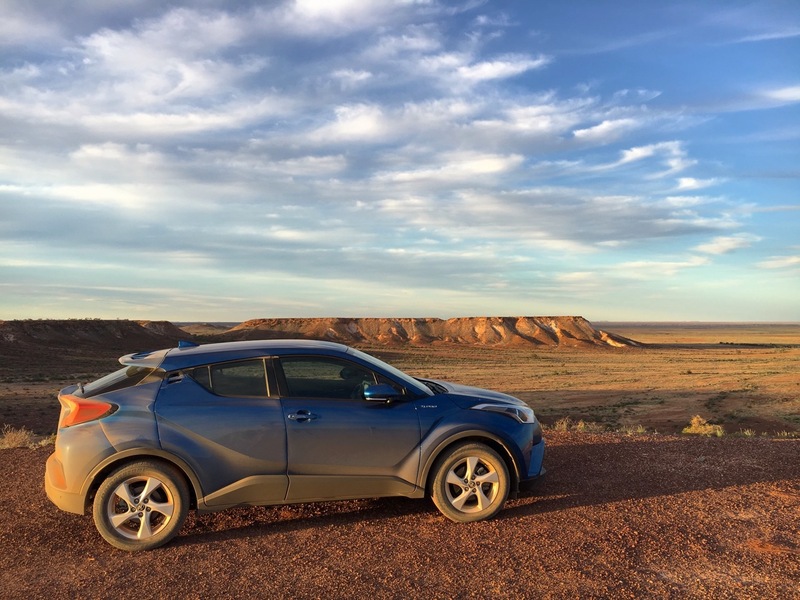 Our Toyota C-HR exploring the Moon Plain near Coober Pedy (click on any pic to enlarge). 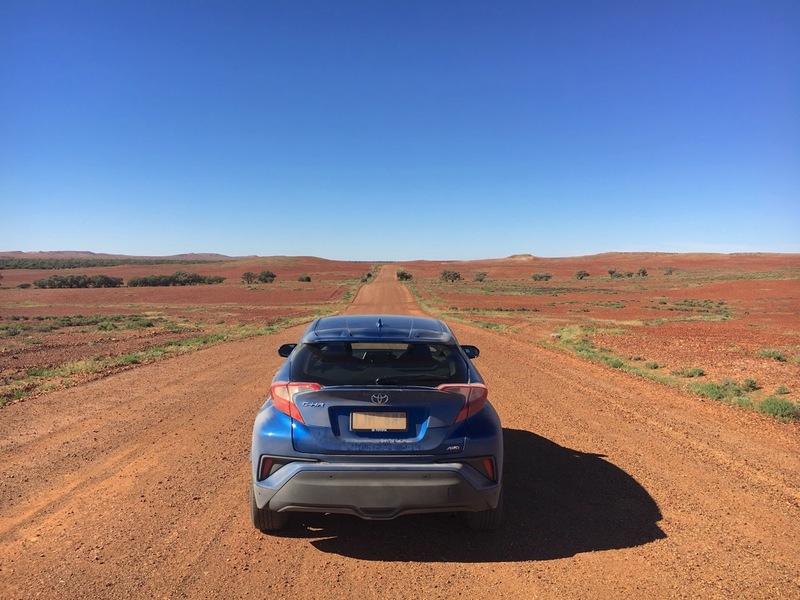 This is Part 2 of our adventure through Outback Australia and the legendary Oodnadatta Track with a Toyota C-HR. 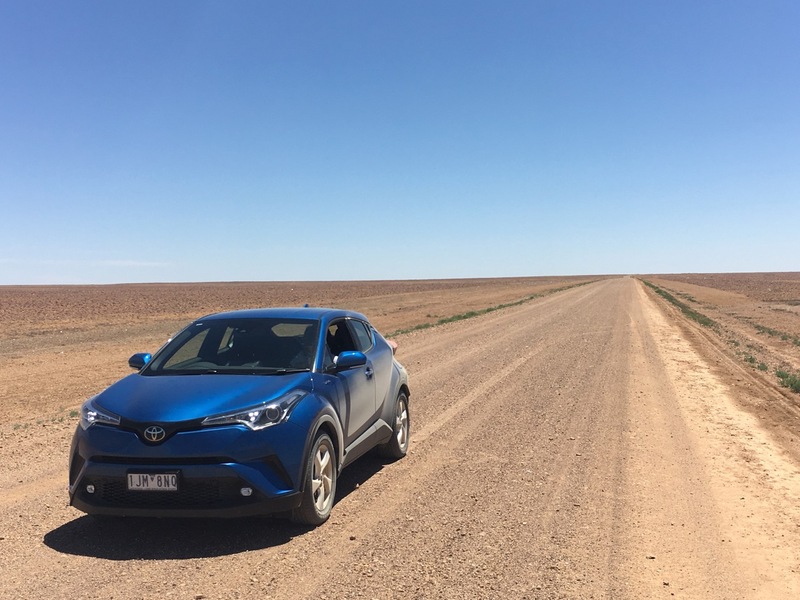 See Part 1: William Creek and Oodnadatta here. After a rather uncomfortable night in an overheated cabin part of the Oodnadatta Pink Roadhouse – the only inside accomodation option available in town, we decide to leave the Oodnadatta Track to head straight towards Coober Pedy instead of continuing onto Marla and the Stuart Highway, as Coober Pedy has a lot to offer and we want to spend a bit of time in town. 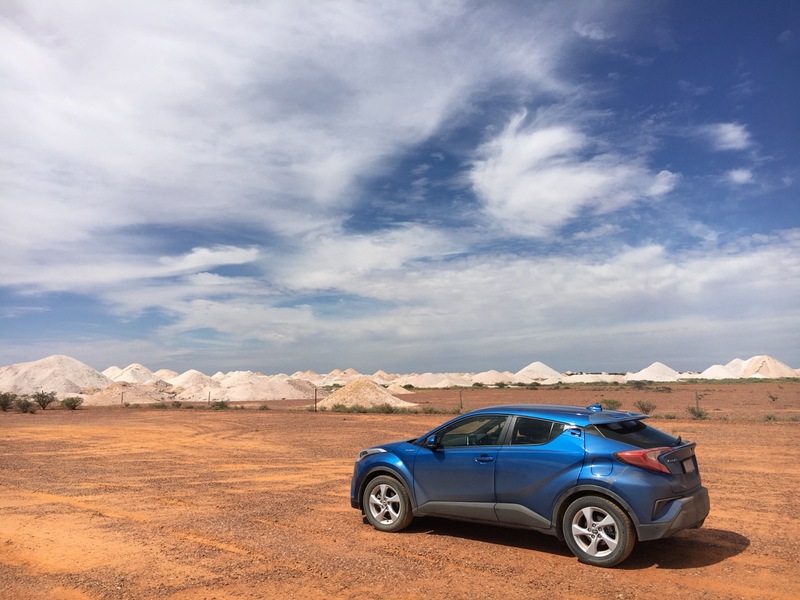 Part 2 of this Photo Report takes us back to Sydney via Coober Pedy. 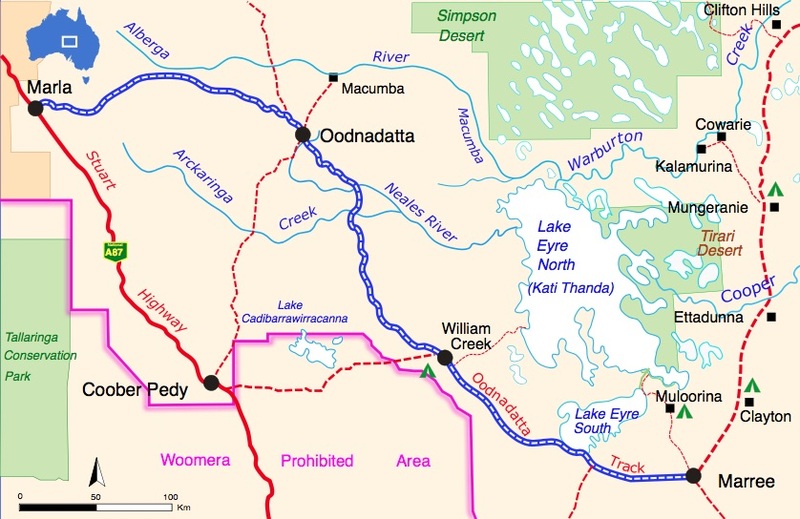 The Oodnadatta Track. 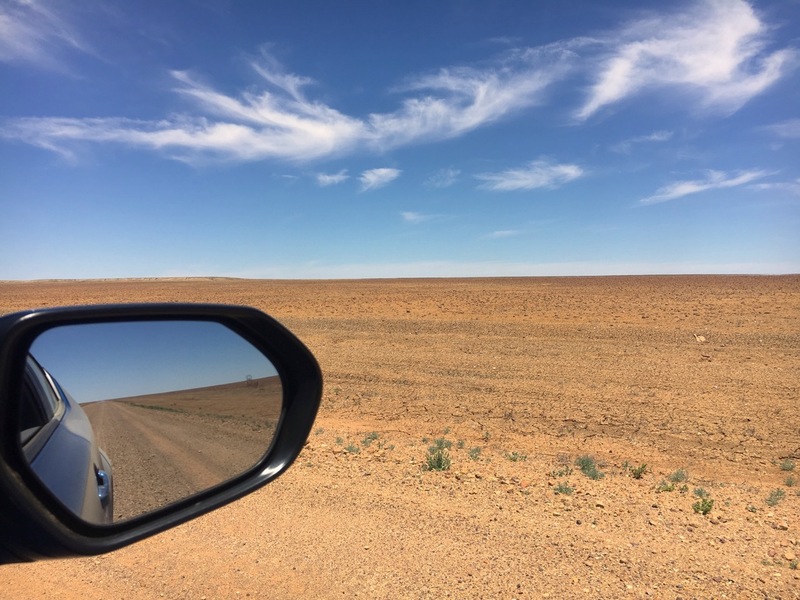 Today we’re cutting Marla out and are headed directly towards Coober Pedy. 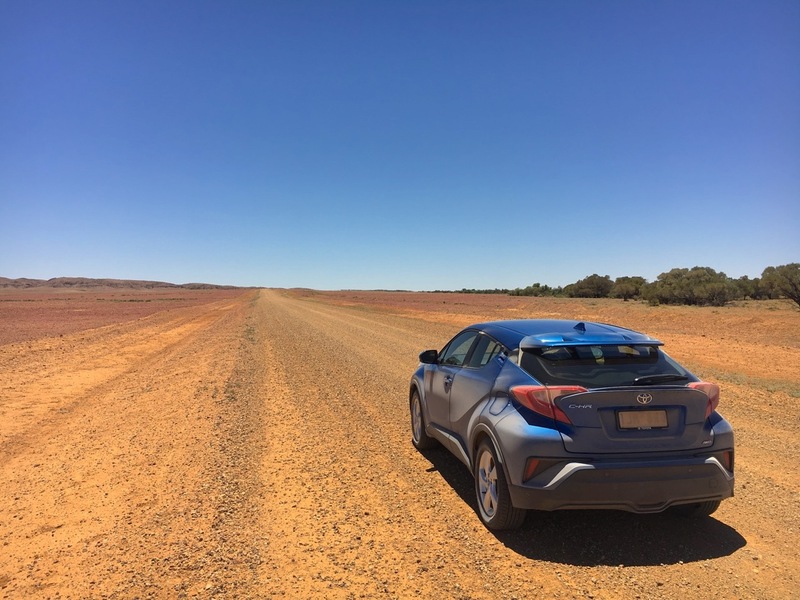 The ever-changing hues of the Australian earth, courtesy of Natasha the Toyota C-HR. …and you will be hit by dwarfing immensities, bewitching nothingness and skies as big as you’ll ever see, all this while traversing – believe it or not – ever-changing landscapes. The colour of the earth never stays the same for very long, oscillating between bright white, sandy yellow, ochre red and everything in-between. And as you’re getting used to the new dimensions around you, complete and utter silence will allow you to isolate your thoughts as if they were written with big letters onto the sky. Still think all of this is boring? 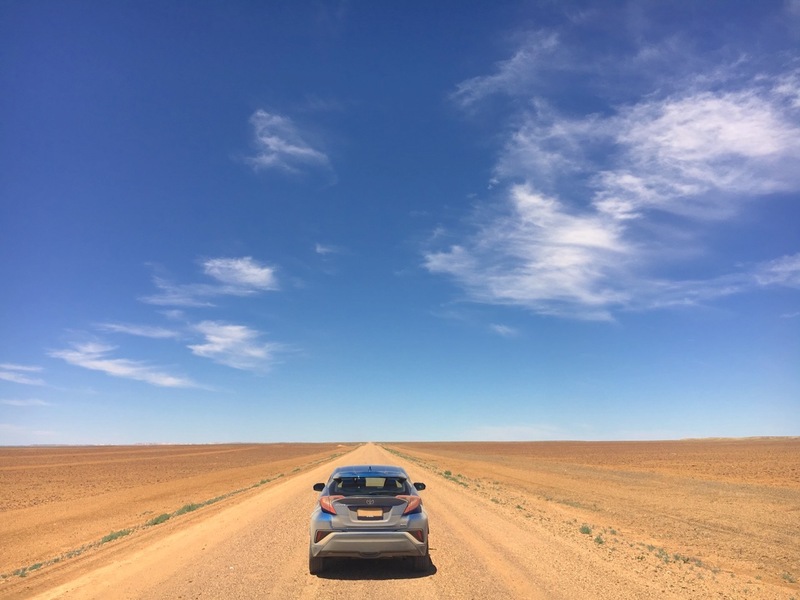 The Grid: an Australian Outback specialty. 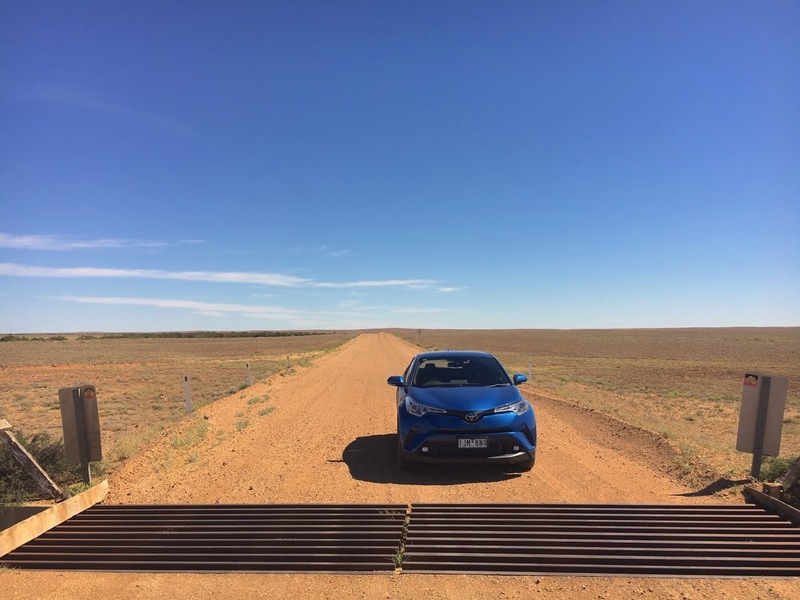 I can’t go through another Outback exploration without mentioning one of the region’s specialties: grids. Barely registering under the wheels when passed at speed, you realise that these grids are actually quite widely spaced when you set foot on them, and that’s the whole point. We humans need to take when walking across, but livestock just cannot twirl their head around it and tend to stay way clear. 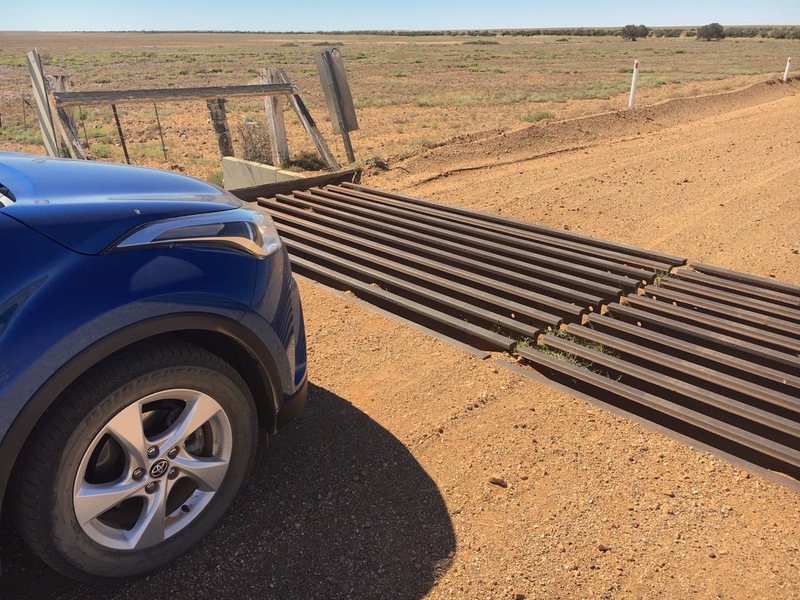 These grids are indeed here to keep cattle within the bounds of their respective homesteads without having to resort to gates that each driver on the Track would need to stop to open then close. All grids are connected to a network of barbwire separating the immense homesteads, which are sometimes so large (such as the Anna Creek station we described in Part 1), the owners use planes or helicopters to herd stock. Moon Plain. 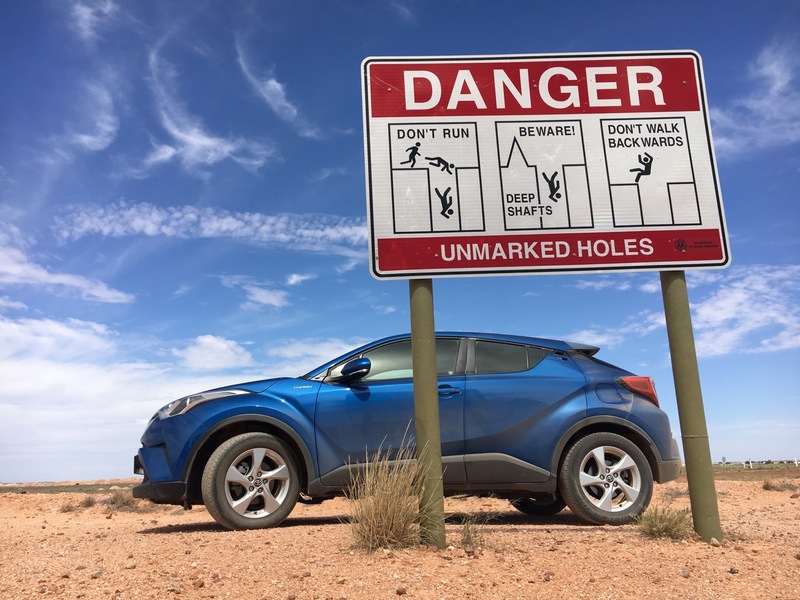 There’s now at least one Toyota C-HR in the world that can say: “I’ve been to the moon and back!” Mad Max 3 and Priscilla Queen of the Desert were shot on the Moon Plain. Before we can get right into the meat of Coober Pedy, there is one last worthwhile detour: the Kanku-Breakaways. An arid Conservation Park covering 15.000 hectares forming part of the traditional country of the Antakirinja Matuntjara Yankunytjatjara people, the Breakaways are called this way because the mesas and low hills appear from a distance as if “broken away” from the higher ground of the escarpment. It’s the perfect spot for a stunning sunset over the orange cliffs, that is if you don’t mind the billion flies that get intensely obsessed with your nose, eyes and ears. I watched the whole thing from inside the car! 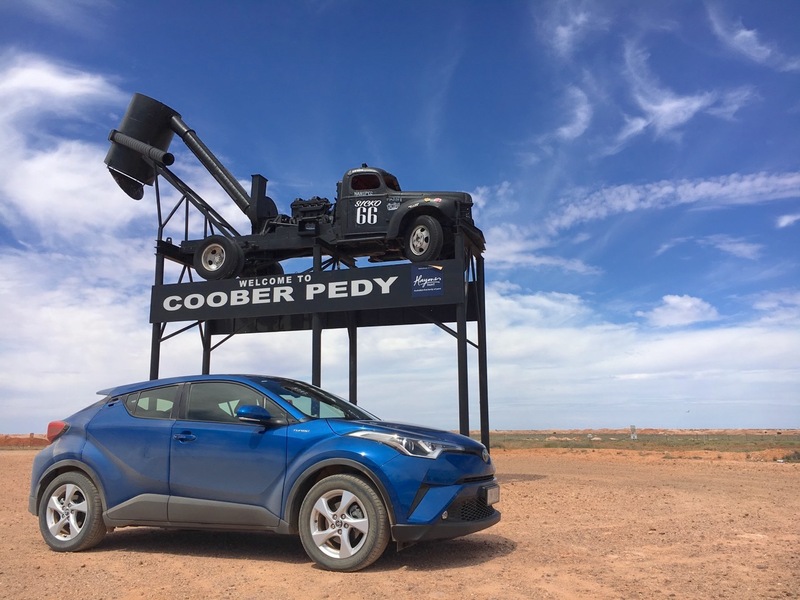 Now our Toyota C-HR baptised Natasha and we are entering famed Coober Pedy. Home to 1.695 inhabitants (including 285 indigenous Australians), it is the largest opal mining area in the world, with over 70 opal fields. The name comes from the local Aboriginal term kupa-piti, which means “White man’s burrows”. Why is that I hear you ask? Well, such is the stifling heat in this part of the world that inhabitants have had to think creatively about where to live. 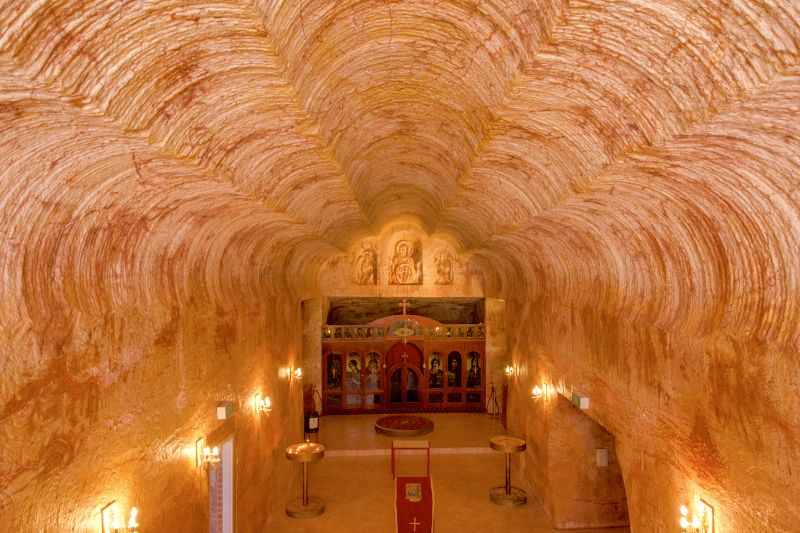 Coober Pedy is indeed famous for its underground residences bored into the hillsides, called “dugouts”. A standard three-bedroom cave home with lounge, kitchen, and bathroom can be excavated out of the rock in the hillside for a similar price to building a house on the surface. However, dugouts remain at a constant temperature when outside regularly exceeds 40°C (104°F). The Underground Motel The Serbian Orthodox Church, and the view inside. 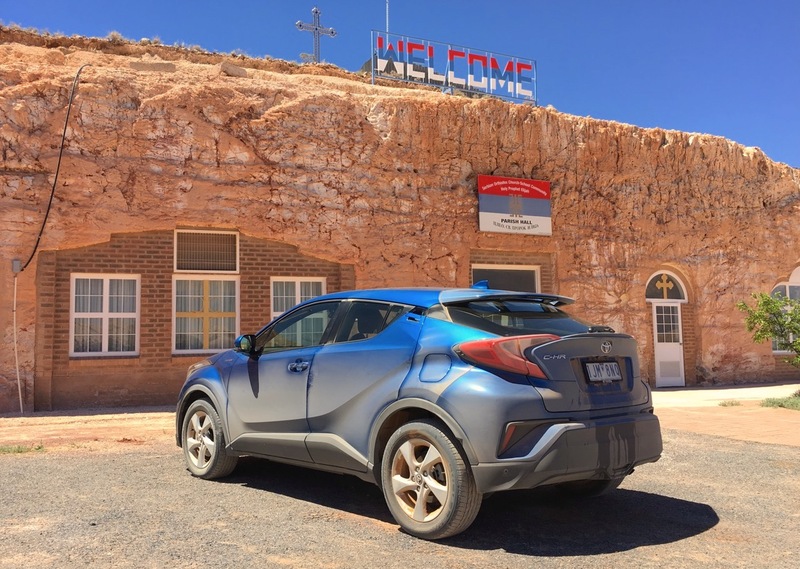 So when in Rome, or rather Coober Pedy, we had to do what everyone is doing here and sleep underground in the aptly named Underground Motel which I strongly recommend. 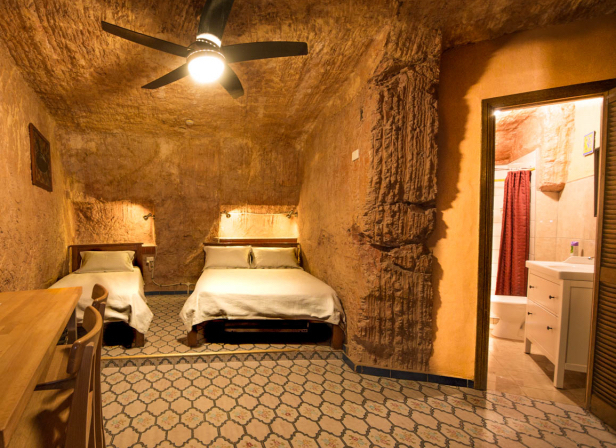 The entire hotel and all its rooms are dug into the hill and the significantly lower temperatures naturally achieved inside do make you think twice about wanting to get out into the heat ever again. It’s a fascinating experience that has to be lived to be believed. There are a few things to visit in Broken Hill too, one of them being the Serbian Orthodox underground church, built in 1993. The whole church complex, with a church, a community hall, a parish house and a religious school, is carved in the sandstone between 3 and 17 meters under the ground level. Today, more tourists visit the church – including us – than there are parishioners. 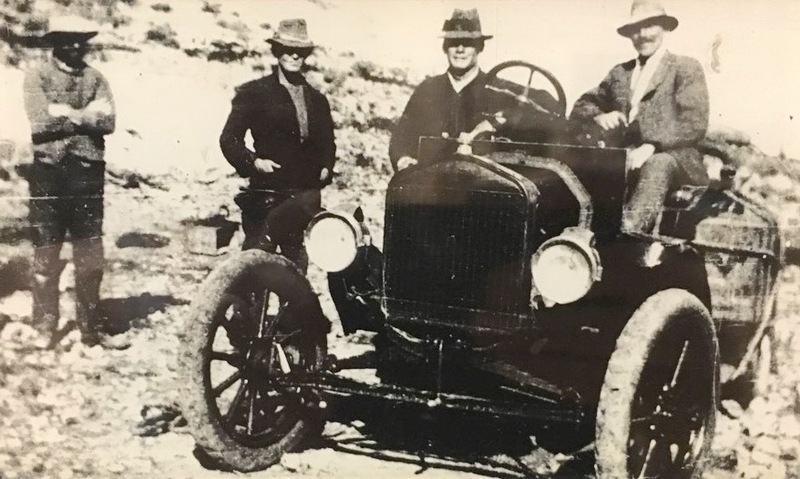 Opal was discovered near Coober Pedy in 1915 and the town was established right after that in a bleak and uninviting spot that was utterly waterless – all water and food had to be brought in. 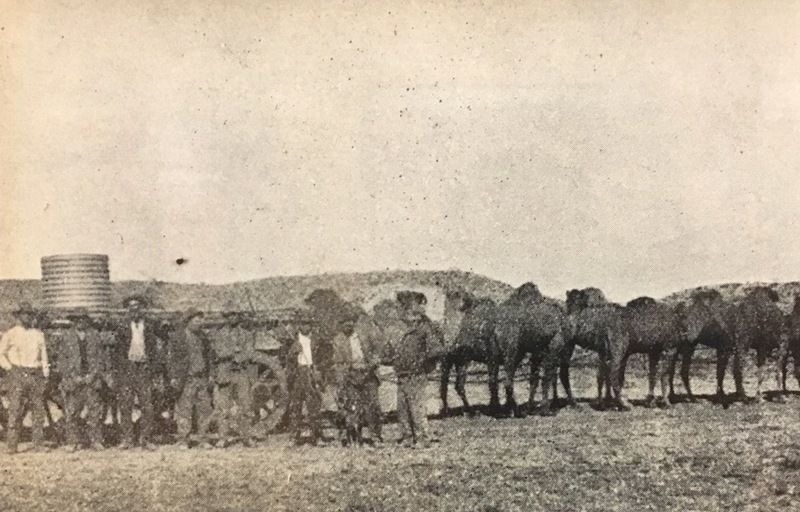 In 1918 news of rain as well as the end of the construction of the transcontinental railway nearby (see Part 1) brought an influx of miners, bringing the population to 100. A request for a Police Officer was ignored by the South Australian government, pushing miners to act for themselves. Yep, the wild wild west right here in Australia! By 1999, there were more than 250,000 mine shaft entrances in the area and a law discouraged large-scale mining by allowing each prospector a 165-square-foot (15.3 sq m) claim. 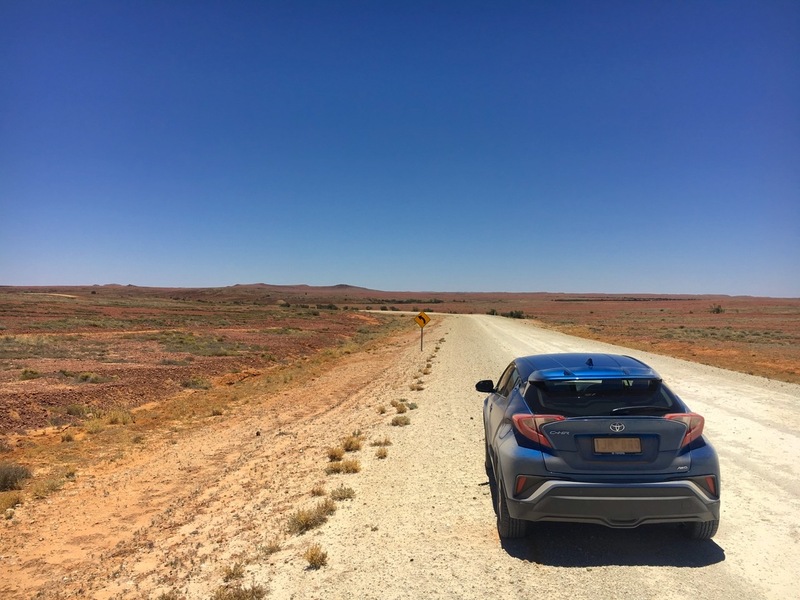 After 650 km/400 mi of dirt tracks we are now back into bitumen for the remainder of the trip (roughly 2.200 km or 1.375 mi), and let’s be honest, Natasha our Toyota C-HR wouldn’t have minded continuing the entire journey on the dirt. 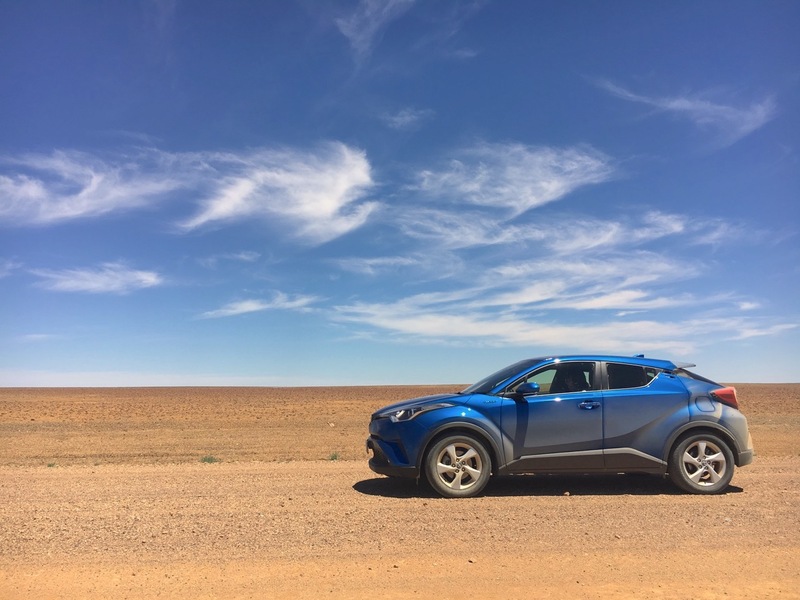 This AWD variant is at home on the graded tracks of the Lake Eyre Basin desert and we’re glad we took it for a spit in this stunningly beautiful part of the world. 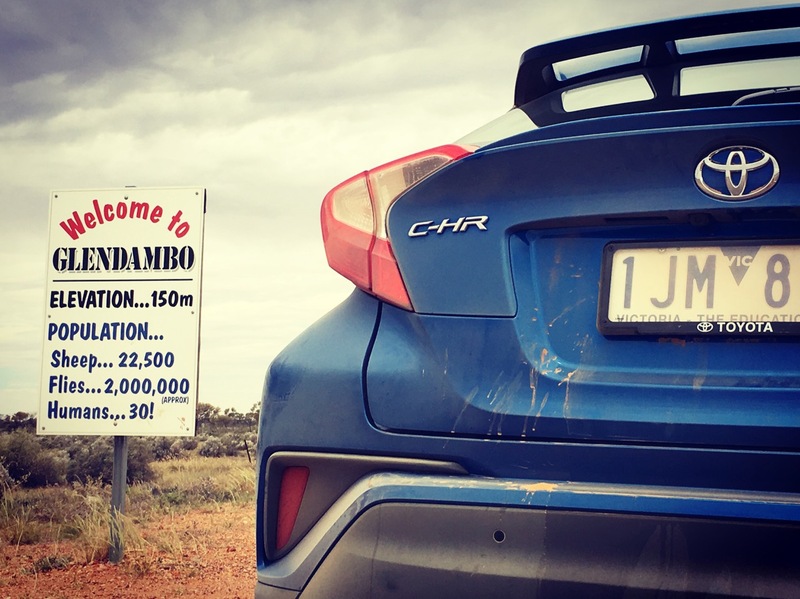 Next stop on our way back to Sydney: Glendambo. 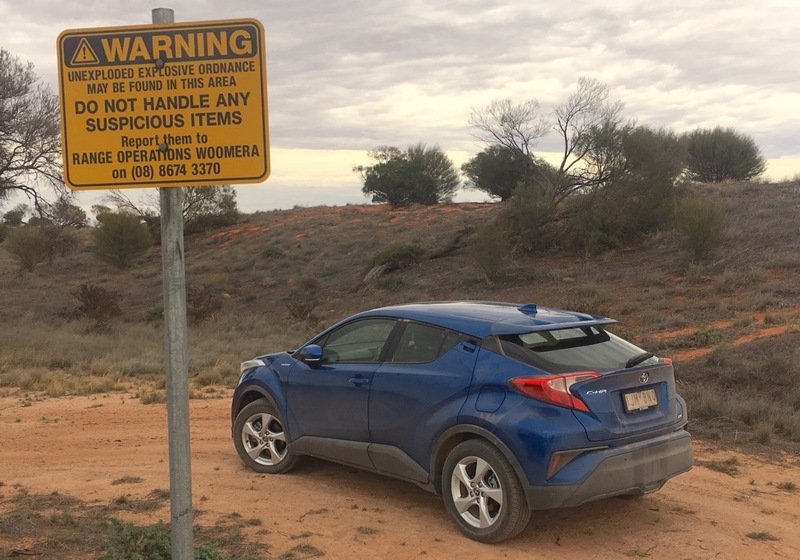 And if flies were the secret weapon of the Breakaways near Coober Pedy, at least this tiny settlement is seeing the humour in it. 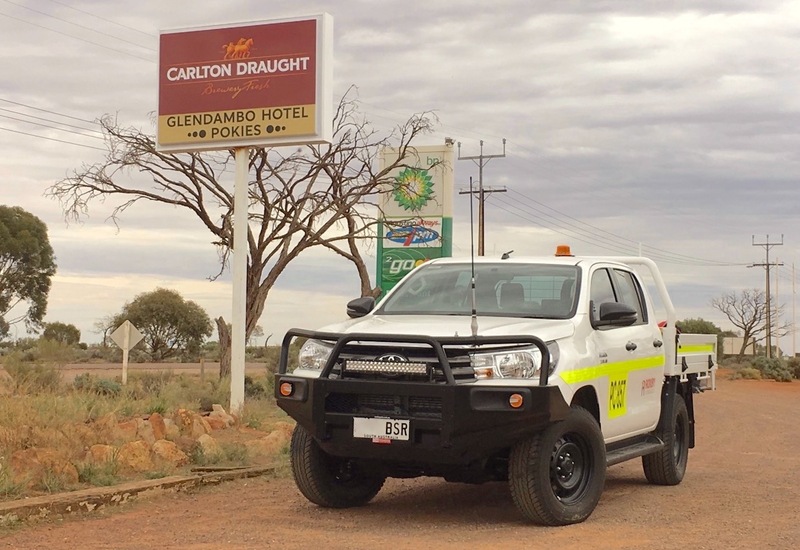 Glendambo officially has a population of 30 humans, 22.500 sheep and… 2 million flies! That’s 66.667 flies on every human. I concur. 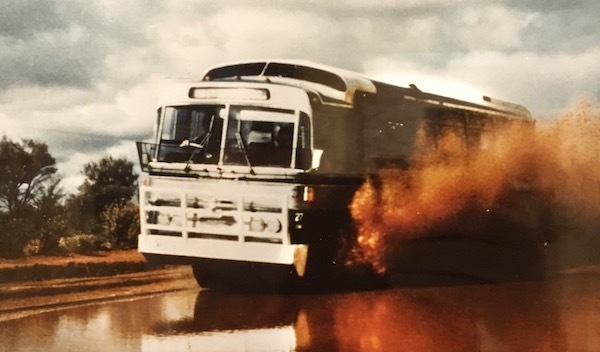 Before looping back onto Pimba, we cross the Woomera Range Complex, a large Australian Defence Force long range weapons and rocket testing ground covering an area of approximately 122.000 square kilometres (47,000 sq mi). That’s roughly one fourth of the size of France! It is named after the woomera, an Aboriginal spear throwing implement which extends the range a spear can be thrown. The airspace above the complex is restricted and controlled by the Air Force for security reasons. 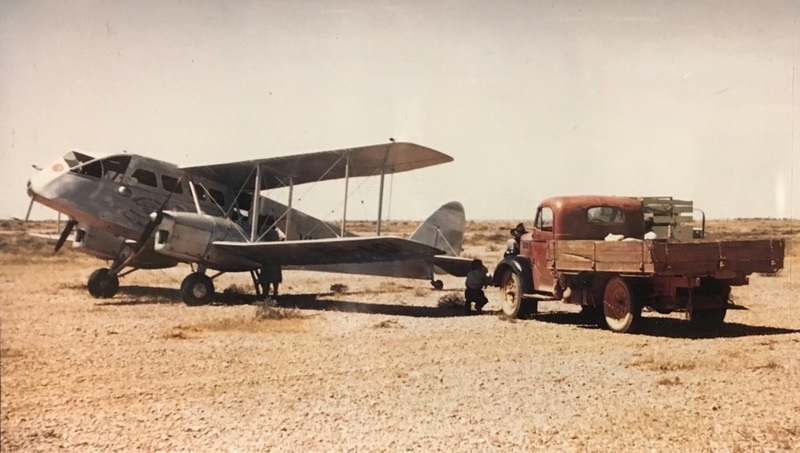 Woomera is the only land-based test range left in the western world that is large enough for the testing of the next-generation of weapons systems such as the F-35 Joint Strike Fighter. 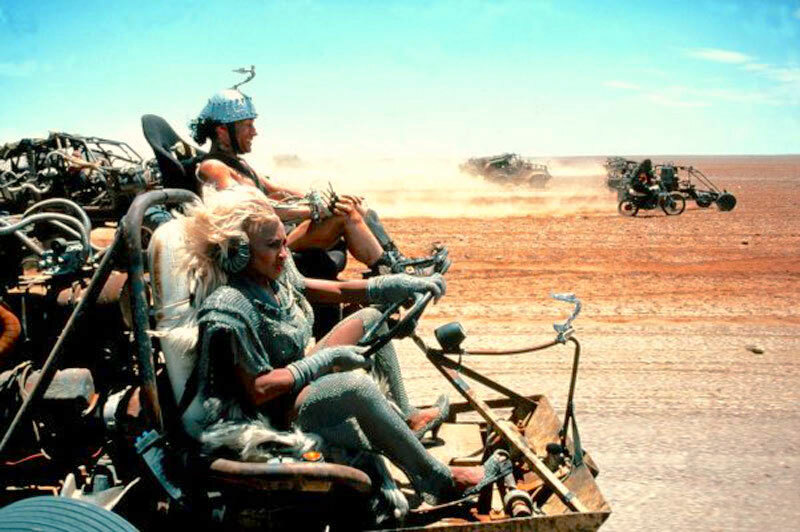 As such, it is an extremely busy base, and bookings for access have been made as far in advance as 2023 (in case you had anything you wanted to test there, no – not cars). Access to the complex is leased to foreign militaries and private companies for their own testing of weapons systems, rockets and drone aircraft. Natasha standing to a heavily roo-barred Toyota Prado in Hay. 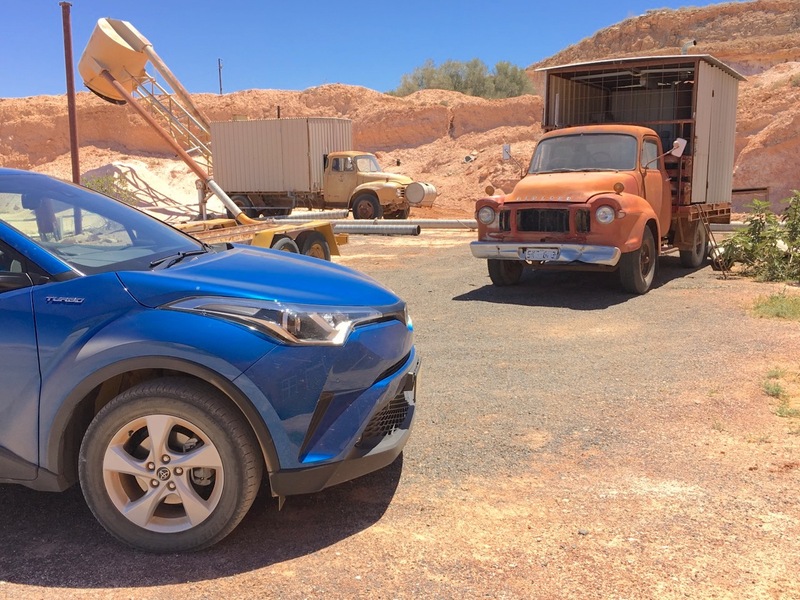 The rest of the trip is a breezy run to Sydney and the opportunity to verify that the Toyota Hilux and Land Cruiser 70 are still kings of the deep Australian Outback. Strong sellers in South Australia include the Mitsubishi Triton, Kia Carnival, Ford Territory, VW Amarok and Renault Koleos. Entering New South Wales from Adelaide, I noticed more-than-usual numbers of Nissan Navara, Holden Colorado, Mitsubishi Pajero Sport, Pajero, Isuzu D-Max and MU-X. 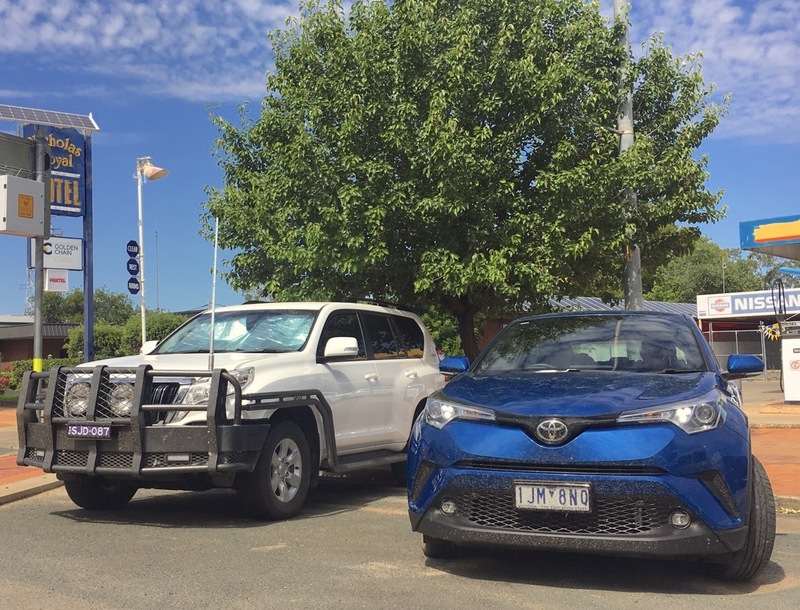 The Australian countryside remains definitely more keen on Chinese vehicles: in Wagga Wagga in New South Wales, I spotted three Foton Tunland, three LDV G10, three Haval H6 and one Great Wall Steed. We arrive back in Caringbah at Toyota’s facilities with Natasha showing 11.820 km on the odo. 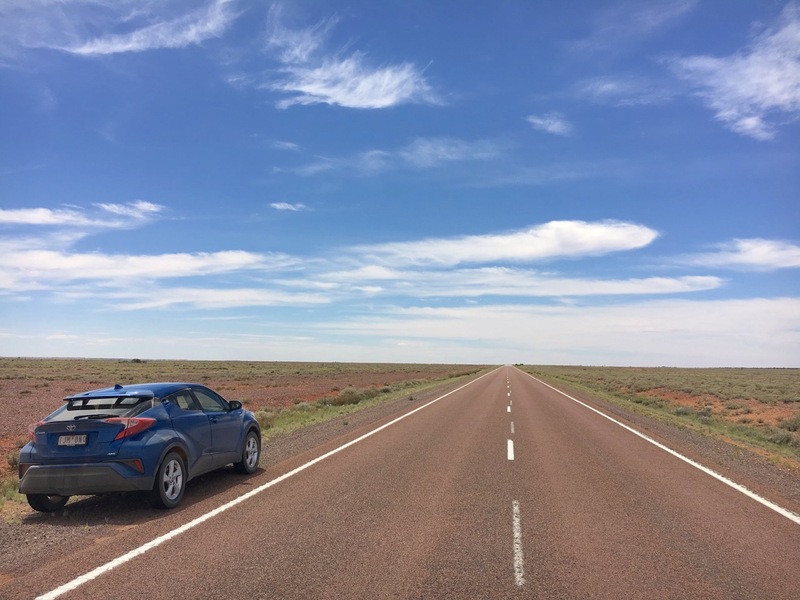 We have just driven around the Australian Outback for 4.972 km or 3.089 miles with not a single technical issue to report. Very impressed by this small crossover that is taking the worldwide sales charts by storm. 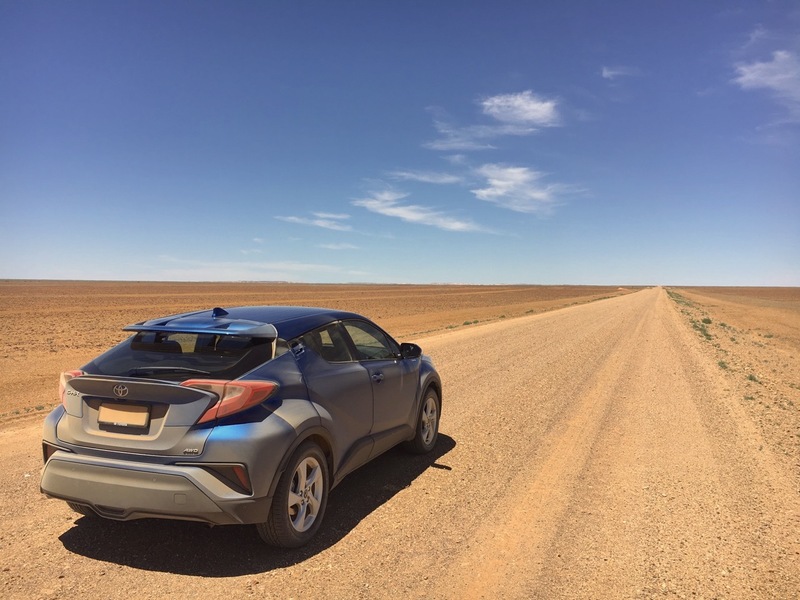 Overall a very confident performance by the Toyota C-HR: everything is working as it should be and no gremlins bugged us during the almost 5.000 km / 3.100 miles journey. 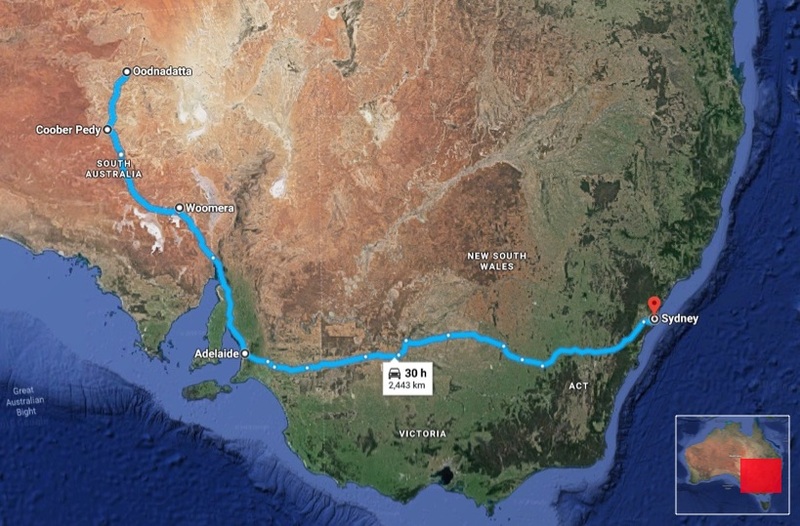 The trip included 650 km of unsealed road driving which posed no issue to the car. 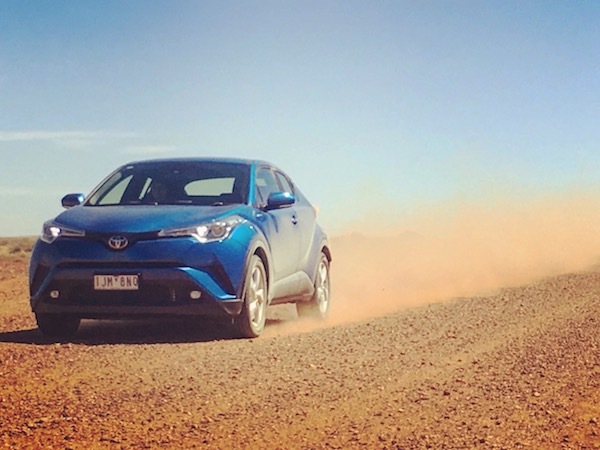 A very aggressive exterior design all round is a true breath of fresh air from Toyota. There are a lot of very interesting design features, notably the tail lights, that makes the car unique and visually-pleasing day after day. Hopefully Toyota’s next launches with follow on the C-HR’s path. A very practical car despite its small size, with multiple cup and phone holders in the front and the space inside the doors has been used optimally with large bottle holders in the back doors – a rarity. Dashboard has very pleasant buttons and more sophisticated materials than you’d expect for a car this price (AUD$30.990, US$24.300, 19.800€), with leather-like stitches on the passenger side, Lamborghini-like A.C. controls and shapes that feel very nice under the fingers. The touch screen is on the smaller side but the GPS does allow unsealed route directions and recognises hotels. Adaptive cruise control is really effective and automatically returns to the set speed after braking or accelerating. One of the best systems I have driven. In terms of safety issues, automatic high beams are not a feature I would expect for this level of price but it’s there, although may need some fine tuning. It worked better than on the Tesla Model X which is almost 10 times dearer. One very useful feature is the inclusion of blind spot alerts on the rear view mirrors, as the design of the rear of the car makes it prone to blind spots. The C-HR letters are projected on the floor when closing the doors at night, and rear view mirrors automatically slide against the door when the car gets locked. 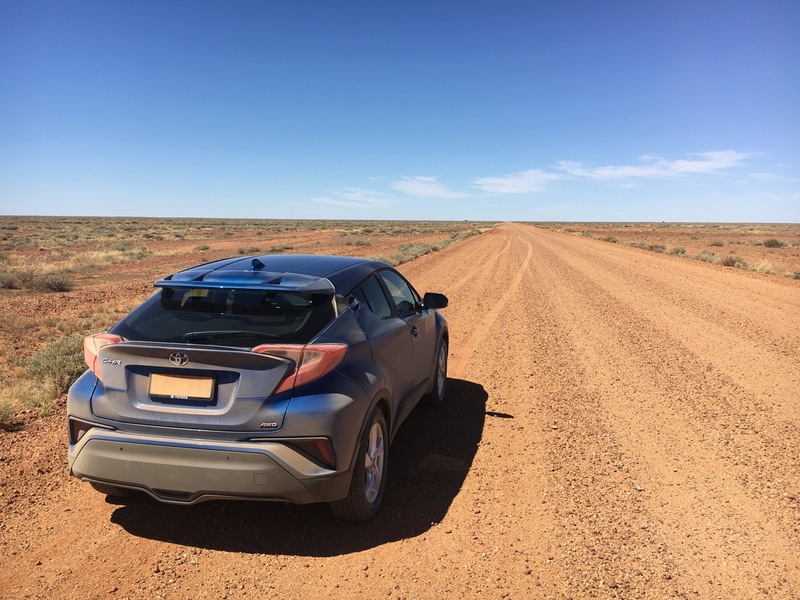 The 500km range is just enough for Outback driving: we didn’t end up having to use our backup jerrycans simply because Natasha is able to drive 95 Unleaded and above which is traditionally the type of fuel available in remote petrol stations, such as William Creek. That’s a marked improvement on both Havals we drove to similar terrain as these would only take 98 and above which was an issue as no remote stations stock this fuel type. Sound system is very good again based on vehicle price, withstanding strong bass without battling an eyelid. One victim of the car’s innovative design is the high up back-seat windows limiting visibility, a mild inconvenience for an adult that can become a tad annoying for shorter persons or kids. Understood as a safety feature, the fact that you cannot input a GPS destination while driving can be frustrating when you have a passenger ready to do it safely without any input from the driver. The glovebox opening is not straight forward and requires a few attempts to work properly. The GPS ETAs when on unsealed roads are based on average speeds of 40 to 60 kph which tends to be on the lower, conservative end. Integrated into the rear doors to achieve a purer design, the rear door handles feel light and cheap when used. 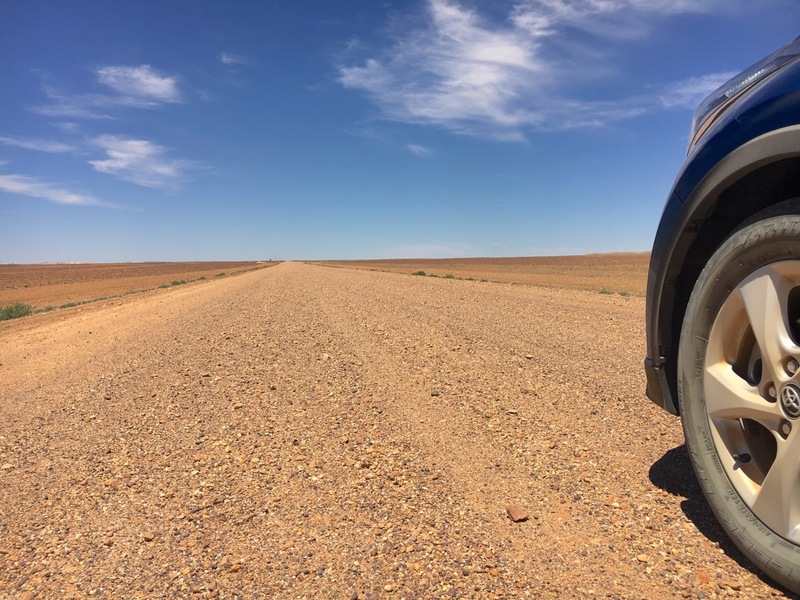 When in deep Outback, our starting point wasn’t recognised because it was too “isolated” but this only occurred once, in Oodnadatta attempting to get directions to Coober Pedy – there is only one way to get there so this wasn’t a real issue per se. 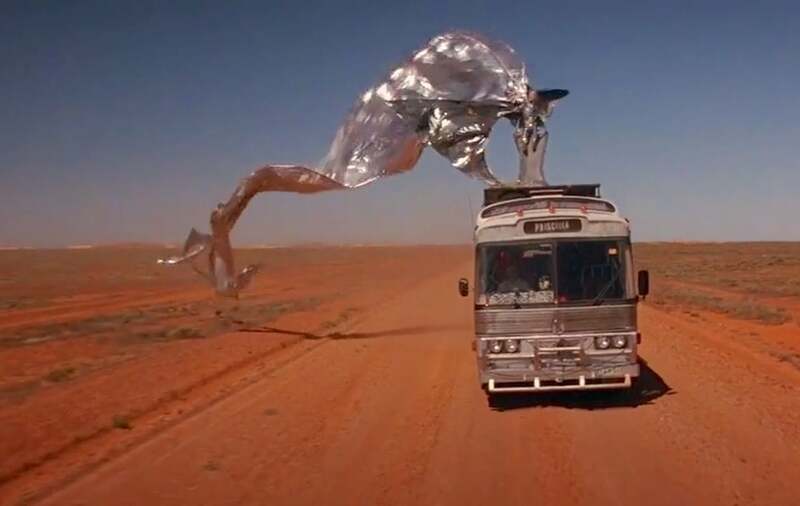 Can become problematic if lost in the desert but then again there aren’t many cars that would calculate destinations at all when in the desert. 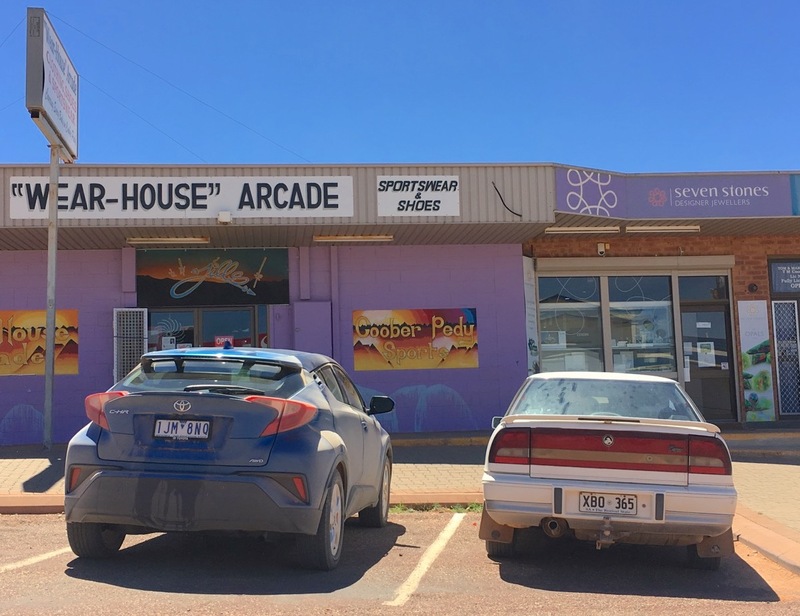 Can you tell me what the white car ( XBO 365 ) parked in front of the ” Wear-House ” Arcade is? Sure – it’s a 1991 Holden Commodore.